The activities of Art & Language have been marked from the outset by practical variety, by resistance to easy categorisation and by a tendency to provoke open and reflexive enquiry. 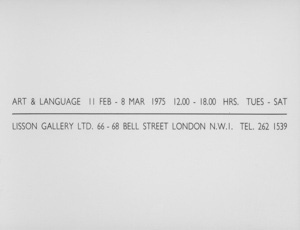 Art & Language’s earliest works date from before 1968, when the name was first adopted as the name of an artistic practice. 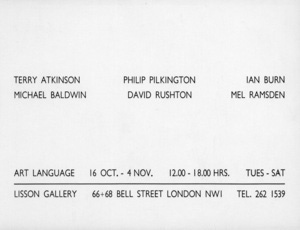 In the following year, the first issue of the journal Art-Language was published in England. 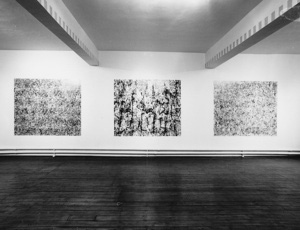 Then and over the next few years Art & Language provided a common identity for a number of people already involved in various types of collaboration. 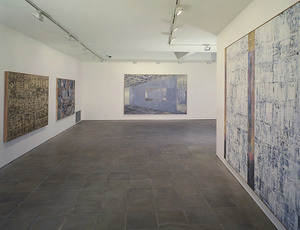 The mid 1960s had seen widespread collapse in the authority of those individualistic cultural protocols which go under the name of Modernism, and the coming together of the two terms ‘Art’ and ‘Language’ served to recognise a range of intellectual concerns and artistic expedients which that collapse had occasioned. 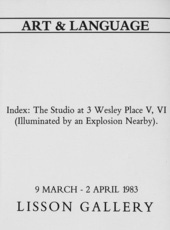 For a variety of activities which bore practically and critically upon the concept of art, but which were at home neither in the studio nor in the gallery, Art & Language promised a social base in shared conversation. 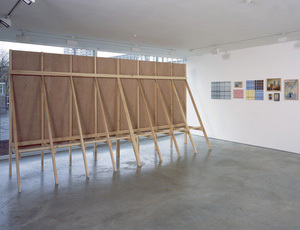 That conversation in turn transformed the practice of those involved and generated other kinds of work. 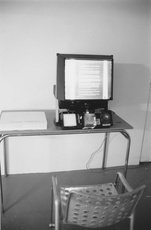 Experimental and sceptical, perhaps their most famous work is Index 01, exhibited at dOCUMENTA 5, Kassel, Germany (1972), a catalogue of their writings in eight filing cabinets presented on four plinths at eye level. 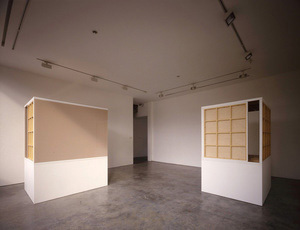 Major solo exhibitions include ‘Nobody Spoke’, Kunstsaele, Berlin, Germany (2017); Museu d’Art Contemporary de Barcelona (MACBA), Barcelona, Spain (2014); Museum Dhondt-Dhaenens, Deurle, Belgium (2013); Migros Museum für Gegenwartskunst, Zurich, Switzerland (2012); Espoo Museum of Modern Art, Espoo, Finland (2009); Centro De Arte Contemporáneo (CAC) Málaga, Spain (2004); MoMA PS1, New York, USA (1999); ICA, London, UK (1991); Tate Gallery, London, UK (1985); Musée d’Art Moderne, Toulon, France (1982) and Museum of Modern Art, Oxford, UK (1974). 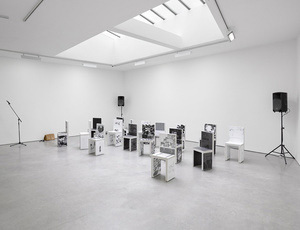 Art & Language have participated in numerous group exhibitions, including 'Guernica' at the National Picasso Museum in Paris, France (2017); 'Conceptual Art in Britain: 1964-1979', Tate Britain, London, UK (2016); ‘Before Normal: Concept After Concept’, Museet for Samtidskunst, Roskkilde, Denmark (2014); ‘Invisible: Art about the Unseen 1957–2012', Hayward Gallery, London, UK (2012); ‘Sound of Music’, Turner Contemporary, Margate, Kent, UK (2009); dOCUMENTA 10, Kassel, Germany (1997), dOCUMENTA 7, Kassel, Germany (1982), the Xème Biennale Internationale d’Art, Palais de L’Europe, Menton, France (1974). 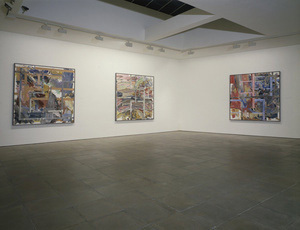 In 1986 they were nominated for the Turner Prize. Acrylic with ink and mixed media on canvas 176 x 149.5 x 4 cm / 68 3/8 x 59 x 1 3/4 in. Acrylic with ink and mixed media on canvas 176 x 149.5 x 4 cm / 69 3/8 x 59 x 1 3/4 in. 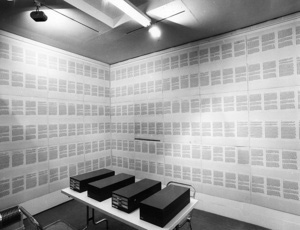 Printed paper and mixed media Part 1: 144 pages of 32 lines of text each printed on grey A3 paper plus one blank page, arranged in a grid and pasted onto one wall. 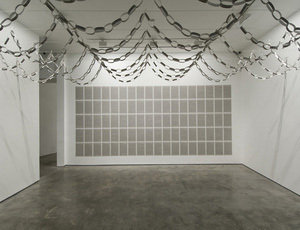 Part 2: 144 sets of ‘paperchains’ consisting of 16 links, suspended in rows on cables stretched between two walls and running parallel to the wall of text pages. Glass, oil on canvas on wood 214 x 142.5 cm / 84 1/4 x 56 1/8 in. Acrylic, ink and pencil on paper Framed: 137.8 x 97.9 x 4.8 cm / 54 1/4 x 38 9/16 in. Oil on canvas on wood with glass 214 x 142.5 cm / 84 1/4 x 56 1/8 in. Oil and enamel on canvas; pencil on paper Painting: 84.5 x 75 cm / 33 1/4 x 29 1/2 in. Drawing: 25 x 21 cm / 9 13/16 x 8 1/4 in. Enamel on canvas mounted to board 105 x 100 cm / 41 5/16 x 39 3/8 in. Acrylic on canvas and mixed media Framed picture: 97.3 x 72.3 x 3.2 cm / 38 5/16 x 28 7/16 x 1 1/4 in. Chair: 98 x 48.5 x 36 cm / 38 9/16 x 19 1/16 x 14 3/16 in. Acrylic on canvas and mixed media Framed picture: 29.3 x 27.9 x 3.2 cm / 11.54 x 11 x 1 1/14 in. Chair: 89.6 x 42.3 x 35 cm / 35 1/4 x 16 5/8 x 13 3/4 in. Acrylic on canvas and mixed media Framed picture: 50.6 x 61.8 x 3.2 cm 19 15/16 x 24 5/16 x 1 1/4 in. 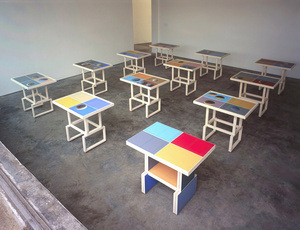 Chair: 100.7 x 47.3 x 39 cm / 39 5/8 x 18 5/8 x 15 3/8 in. Glass over oil and mixed media on canvas on wood 69 x 60.8 cm / 27 3/16 x 23 15/16 in. Glass over oil and mixed media on canvas on wood 82.9 x 70 cm / 32 5/8 x 27 9/16 in. Oil and enamel on canvas and mixed media 98 x 175 cm / 39 9/16 x 68 7/8 in. Ink and crayon on paper and mixed media Part 1-2, 67.0 x 99.3 cm / 26 3/8 x 39 1/16 in. Part 3, 53.0 x 48.0 cm / 20 7/8 x 18 7/8 in. Ink on photostat and mixed media Part 1, 69.0 x 107.0 cm / 27 3/16 x 42 1/8 in. Part 2, 53.0 x 48.0 cm / 20 7/8 x 18 7/8 in. 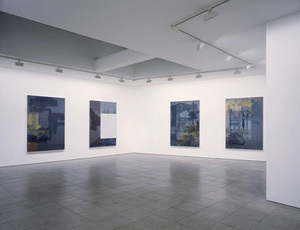 Printed paper and mixed media, 144 prints on paper, 144 garlands consisting of 16 links 300 x 755 x 830 cm / 118 1/8 x 297 1/4 x 326 3/4 in. HD Video 15 min. 36 sec.